At my non-profit job, we’ve been launching into a new initiative based at our field site in the Koeye River Watershed. Recognizing the interconnectedness of the relationships between our people, our territory, and the key species we rely on, we’ve launched a strong Salmon Stewardship Program under our Coastwatch Heiltsuk Monitoring Initiative to ensure we’re managing this important resource with the best tools and information at our disposal. 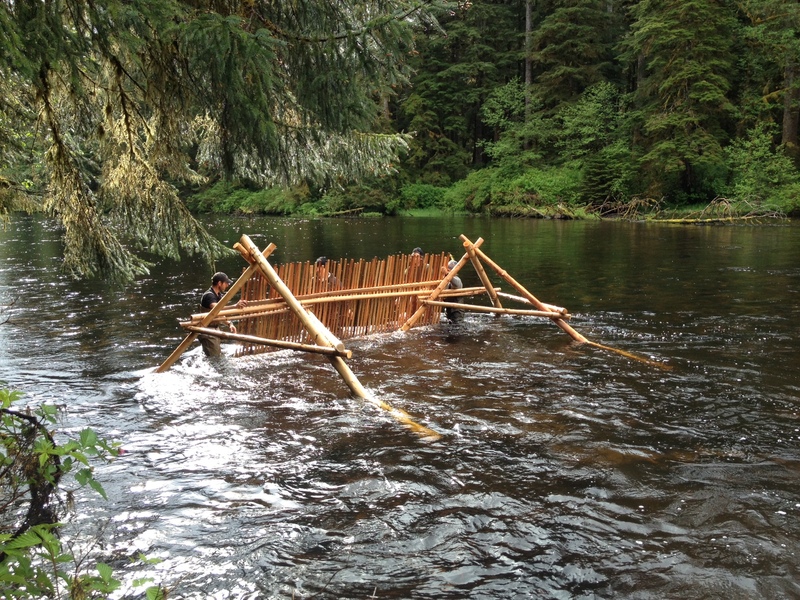 An exciting element of this Salmon Stewardship work is our fish weir project. 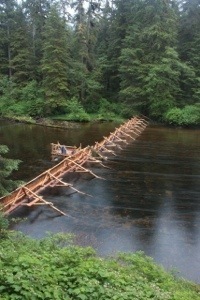 Supervised by Salmon Program Coordinator Will Atlas with assistance from some amazing folks at Hakai Beach Institute, this involves the construction of a cedar- and alder-wood weir across the whole width of the Koeye River above tidewater, which allows our team of Heiltsuk technicians to count every individual sockeye heading upstream. As far as our ongoing theme of “consilience” goes, this represents an incredible overlap between IK (indigenous knowledge) and western science. We’re combining the soundest elements of both in order to achieve better stewardship outcomes in our territory, and it’s exciting to be a part of it! I’d like to invite you to check out an amazing little video from our friend and colleague Ilja Herb, who joined us during the construction stages of the weir project and is currently on his way back up the coast to film its operation. This video will give you a beautiful, visual introduction to the project, and there’s more to come as the summer progresses! If you feel compelled to make a donation, your support has a huge impact at this scale. You can donate online, or contact my office for more information. I was privileged recently to join a delegation of First Nations leaders from across Canada in a trip through Northern Australia. This article from a Sydney newspaper shares a little of what we were doing. They are on their way to meet the stone country people on the remote Western Arnhem Plateau, but first the delegation of Canada’s First Nations stops in Kakadu National Park to visit the man who said no to millions of dollars. Senior custodian Jeffrey Lee takes them to Koongarra, his bush site that might have become a uranium mine worth as much as $5 billion. If only Lee had said yes. His 11 guests from nine First Nations find nothing strange in this. ”Heartwarming, but not surprising,” says Steve Nitah of the Lutsel K’e Dene Nation. Nitah says native Canadians derive 70 to 90 per cent of their diet from the land but are fighting their own battles with resource developers, from foresters to gas pipeline builders and tar sands miners. They only wish they had the power of veto that Lee enjoys under the Northern Territory land rights act. Lee’s father and grandfather had wanted the mine but, after a decades-long battle, he has succeeded in his own determination that Koongarra be folded into the world-heritage park that surrounds it. They are sweltering in temperatures of 30 degrees-plus. Some of them are more comfortable in -30 degrees. But they find they have much in common with indigenous Australians like Lee. It is why the Pew Charitable Trusts has brought them here. The US-founded global philanthropic giant, which built its perpetual fund on the Pew family’s old oil fortune, is focusing its environmental work on the world’s remaining ”big scale” treasures – the kind of intact ecosystems over vast landscapes that can still be found in Canada and Australia. So early on Saturday, we board single-engine planes bound for Warddeken, an indigenous rangers’ camp in the stone country of the Mok clan. This tiny outpost is protecting what Pew’s Australian director, ecologist Barry Traill, calls a ”global gem of biodiversity”. The Warddeken Indigenous Protected Area is half the size of Switzerland, almost 1.4 million hectares that contain species found nowhere else on the planet: the black wallaroo; the Oenpelli python, rock rats, birds, many plants. It boasts thousands of rock art sites. But wildfires that can burn for months and grow to ”the size of Sydney” would threaten it all if not for the pioneering indigenous fire management at Warddeken, says Traill. This work earns Warddeken and neighbouring indigenous groups a break-even $1.2 million a year for the abatement of 100,000 tonnes of greenhouse gases. Warddeken is one of 58 Indigenous Protected Areas that cover more than 51 million hectares of Australia and employ almost 700 indigenous rangers. Launched by the Howard government and expanded under Labor, IPAs are not forms of land tenure. They are agreements between the federal government and traditional owners under which the locals are supported to care for land that is otherwise neglected. Pew supports several IPAs and believes they can be a model for the Canadians and their own treasures such as the boreal forest, the largest intact forest in the world. The visitors agree. ”I’ve been fighting for something like this for six years,” says Douglas Neasloss of the Kitasoo-Xaixais Nation. But Warddeken may never have happened if not for ”the old man”, Lofty Bardayal Nadjamerrek, AO. Locals had left the area for bigger settlements around World War II and earlier. Nadjamerrek was among pioneers who led a homeland movement back into Arnhem Land in the 1970s and ’80s and, finally, a return to his own country in the late 1990s. He lived until 2009, just long enough to witness its declaration as an IPA. Much damage was done in those lost years by wildfire, invasive weeds and feral animals. The IPAs, he says, allow the people who know best to work ”on country”. The on-site operations manager at Warddeken, Jake Weigl, says their controlled mosaic burning ”absolutely replicates” ancient fire practice but exploits modern tools. In the early dry season, they drop incendiary devices from helicopters. He describes how a helicopter will drop a team of just six to nine rangers – armed with only rake hoes, chainsaws and leaf-blowers – to resist fire fronts as big as 50 kilometres. The chairman of Warddeken Land Management Limited, Dean Yibarbuk, points to the return of emu to the area as evidence of the rangers’ success and the recovery of species. The Nature Conservancy also supports the operation. Pew has backed IPAs elsewhere, including the Kimberley. It is supporting the Ngadju people to protect the Great Western Woodlands in the south-east of Western Australia. It worked with graziers and indigenous groups to secure the exclusion of mining leases from the Queensland Channel Country rivers and floodplains that feed Lake Eyre, but now they are battling the Newman government’s declaration that it will allow mining after all. Pew has some enemies, notably elements among recreational and commercial fishers who believe it has supported research that overstates the threat to global fish stocks. Pew stands by the research. Traill derides a conspiracy theory that Pew is backing marine parks in Australia to exclude oil exploration – to benefit American oil producers. Pew no longer has any money in oil, he says. When established in 1948, founder J. Howard Pew wanted to ”acquaint the American people with the evils of bureaucracy and the values of a free market”. His heirs have a less conservative focus but the group claims to be non-partisan. Little of this concerns the daughters of Lofty Bardayal Nadjamerrek, Lois and Hagar. They welcome the First Nations people to their country by inviting them to enter a spring, where they pour water over their heads. In their dreaming, it is the nectar of the sugar bee. ”We are really proud to have that mob coming from Canada,” Hagar says. It was their father’s vision to share their knowledge with the world, she says. The Pew Charitable Trusts assisted Fairfax Media’s travel from Kakadu to Arnhem Land. 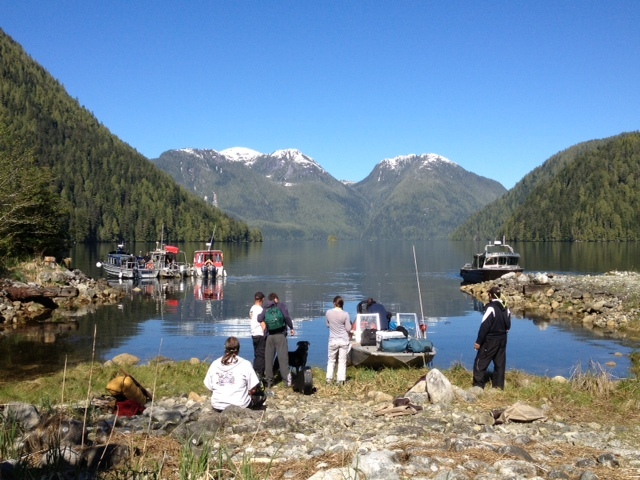 This May, I was privileged to co-instruct a field course with a dear friend and colleague, Dr. Chris Darimont, through UVic’s Department of Geography. Along with 15 bright and amazing students, we explored the theme of consilience – in particular, how western science and indigenous knowledge can run parallel or even overlap to achieve stronger stewardship objectives. It was my first experience teaching. And it was magical. 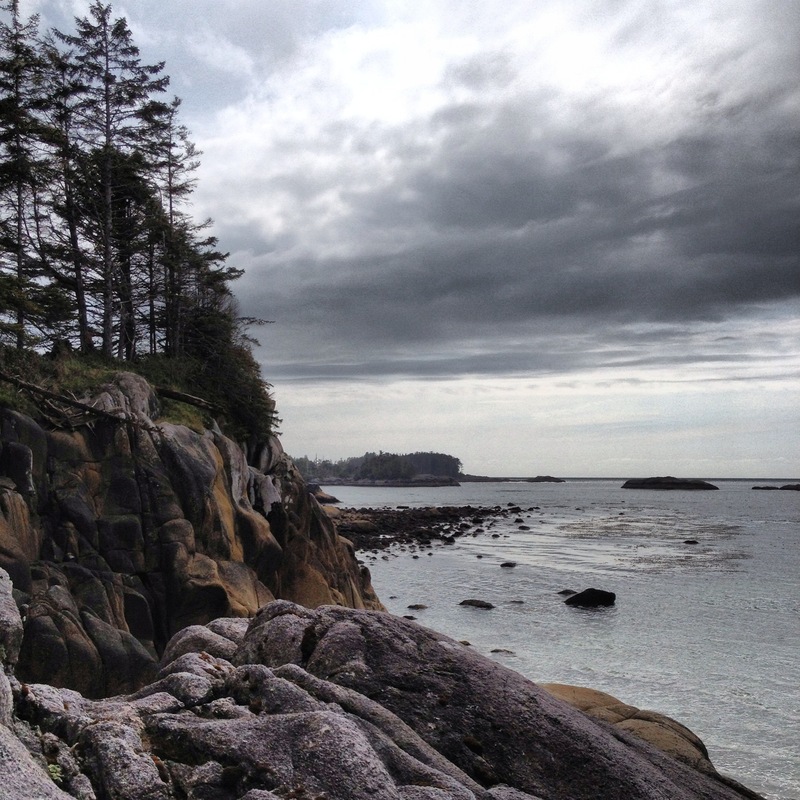 Together, we explored many of the landscapes that are dearest to my heart: Koeye, Hakai, and Goose Island. Students brought diverse backgrounds to bear on the values, ideas and solutions common to biology, ecology, environmental studies, geography, First Nations studies, resource management, political science, and even my background in literature. What I want to share is this: Meaningful and authentic collaboration is possible. It has a language and a grammar that root our conversations in respect. It has basic principles that guide our interactions and teach us to navigate a route together. It is multidisciplinary, it is exciting, and it is a process that is never completed. That’s where the sweetness lies. The other thing I want to share is this: The fifteen students who participated in our class are already leaders in their field, and they are growing to be experts on collaboration and engagement, authenticity and respect, and yes, on consilience. It was a pleasure dear to my heart to share this time with Chris, and I’m deeply grateful for everyone who was so gentle with me as I walked this path with them.